Pile o’ prints! 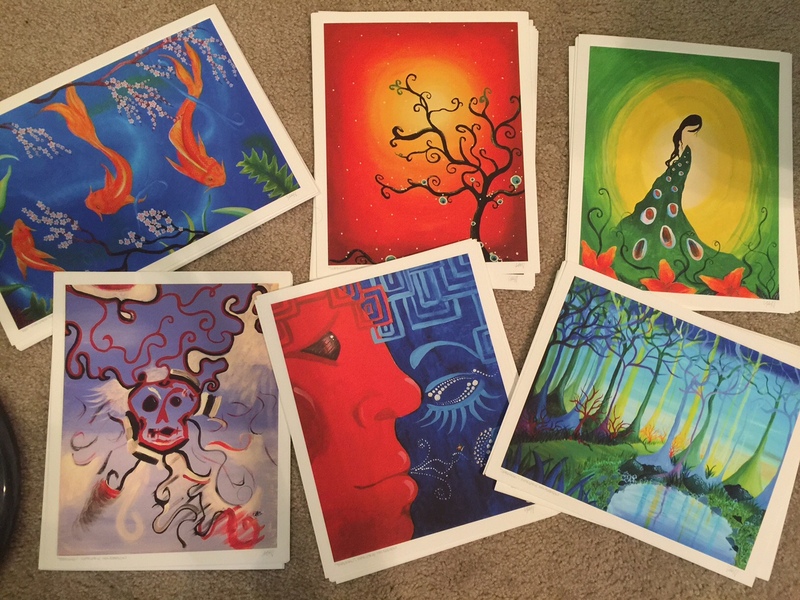 All prints of original paintings by Marjorie Henderson. I’m starting to get jitters! I’m so stoked to be part of RAW Portland’s artist showcase this Thursday, May 14th, from 6-10pm at Holocene, 1001 SE Morrison in Portland, Oregon! This is my first huge group show since moving to Portland, and it’s exciting to be part of such a great event. I’ve noticed that with each show I participate in, the layout and feel constantly changes and grows as I gain more experience. It only helps me get a clearer picture of how I want me and my art to be portrayed as. It’s really evolving into a brand, with everything that I want to do with my art, I want to go as far as I can! I’ll be bringing a good amount of jewelry, mostly glass and semiprecious stones with recycled or vintage components mixed in. I will also have prints available for the very first time which is really huge for me. For a while, particularly in my early college years, I did not want to break into selling prints of my paintings and drawings. I wanted to be able to sell my originals in various sizes at affordable prices. This evolved, however, once I started painting larger pieces that took longer and longer to complete. I still wanted to share art with everyone and affordably, but then again, not everyone wants a giant three foot by four foot painting in their home right? I had also noticed that I have started quite a collection of prints myself of various art that I have encountered throughout the years. I’m starting out with a small run, and seeing how it goes from there. Prints will be available after the show on my Etsy shop, as well as at Artistic Portland beginning June 1st at their new location at 318 SW Taylor St. in Portland. That one with the trees and the pool looks completely amazing. I love it!